3) Jalicso I vs Cesar Sando Jr.
****. 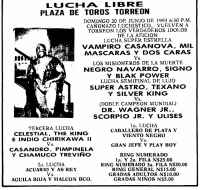 Jalisco is said to be 7-1 mask matches (lost his mask to Kung Fu & Kato Kung Lee Sr.) and 30-0 in mask matches. 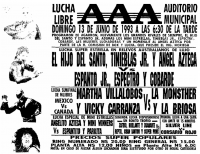 Sando is said to have won 15 mask and 10 hairs, include hairs of Vulcano & Tony Arce, and having lost his hair to Valente Fernadez, Perro Aguayo, Cobrade I. Ref went down, Rudo ref ran in to count the three for rudo Cesar, original ref restarts the match. Jalisco gets a three count when the ref missed Cesar getting his shoulder up. Cesar complains, and Jalisco asked for a restart. Match went 4 more minutes, and Jalisco got the same cradle for the three count time. Cesar cuts his own hair. 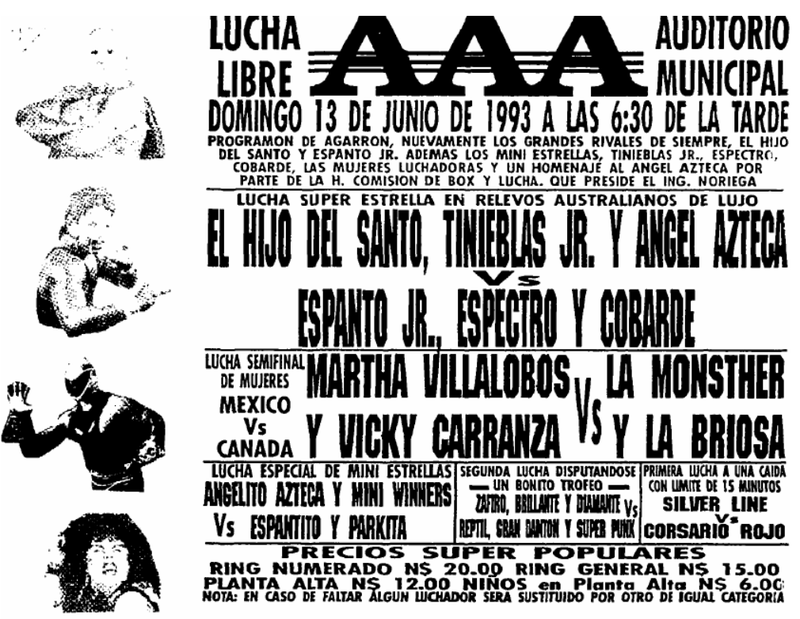 2) Caballero De Plata vs Gran Jefe Jr.
Straight falls, Yamato pinning Vera. Signo retained the title. Scorpio got the pinfall in the first, Signo took the second, and Signo kicked Scorpio Jr. over the railing in the third. Going over the barrier is an automatic DQ. 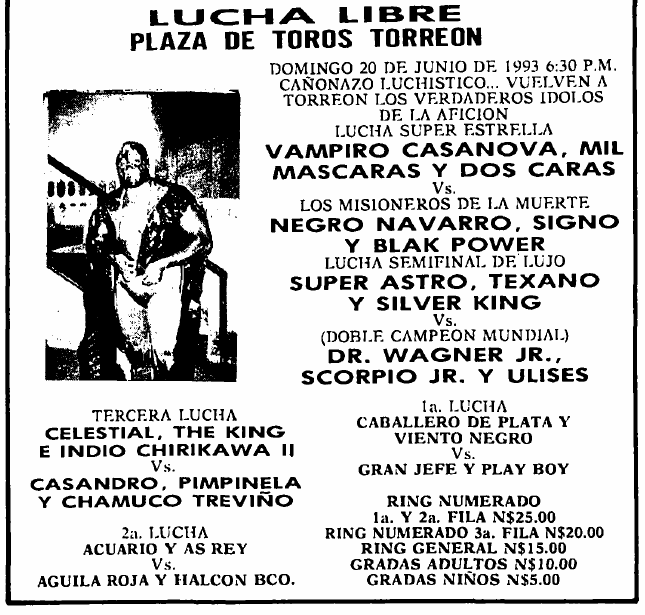 2) Vitalic b Muralla Del Ring Jr.
5) Mercurio, Superstar Sr., Triton b Cosmos, Marco Polo, Muralla Del Ring Sr.
1) Guerrero Místico vs Atlantic Jr.
1) Stuka Jr. vs Reptil Jr.
4) Gran Hamada, Silver King, Texano b Dr. Wagner Jr., Killer, Scorpió Jr.